With wedding invitations, save-the-date postcards, and almost-forgotten RSVP cards tucked under magnets and covering every inch of your refrigerator door, it’s time to start shopping for wedding gifts. You could peek at the couple’s gift registry, but it’s probably already been picked over by the early-bird gift buyers and might contain only a handful of overpriced kitchen gadgets destined for the donation pile. Instead of falling back on a generic gift card or wad of cash, which shows no imagination and will get swallowed up into the newlywed’s budget and forgotten, get creative with unique wedding gift ideas that can be personalized. Here are the best personalized wedding gifts to shower every couple with. 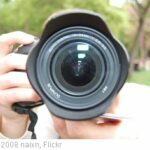 After the buzz of the wedding and honeymoon, newlyweds look forward to receiving their professional photographs so they can relive the excitement of the big day. 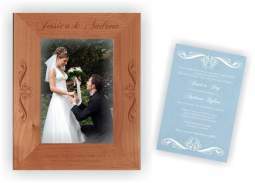 Whether it’s a posed photo of the pair gazing lovingly at each other, or a candid of the smashing cake in each other’s face, help them frame their favorite memory with a personalized frame, such as the Customized Wood Wedding Photo Frame. Dating may have been all about nice dinners out, but for many couples, the newlywed days feature plenty of misguided cooking attempts and pizza delivery. Help them get a decent dinner on the table with a personalized cutting board. 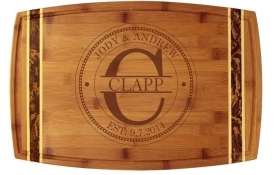 The Circle Monogram Totally Bamboo Cutting Board is the perfect way to show off their new last name, as well as the year they tied the knot. Does the happy couple like a little more rustic look? 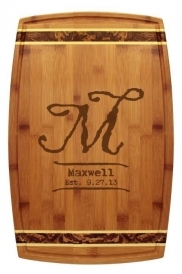 Try the new Rustic Monogram Totally Bamboo Cutting Board design instead! With a look reminiscent of a wine barrel, it makes a great addition to any country kitchen. 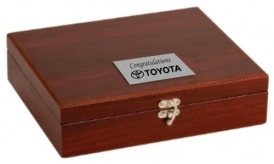 Help them keep the romance alive long after the vows with a wine presentation box. 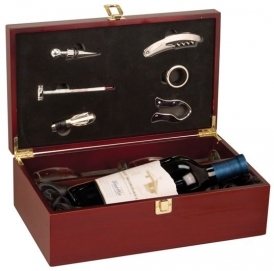 The Wine Presentation Box With 6 Tools and 2 Glasses contains everything they need for a romantic evening at home, including glasses, corkscrew, stopper, and thermometer. Just pop in a bottle of vino and encourage the happy couple to use it for celebrating a milestone such as a promotion, new home, or 1-month anniversary. Or, they can use it to reconnect after their first newlywed spat! Or, give them all the tools they’ll need for their future sips with the Five Piece Wine Tools Gift Set. 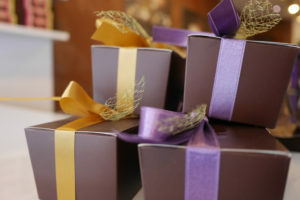 During wedding season, it can be tough to keep up with all the gifts you need to purchase. Put a little imagination into it, consider personalizing, and take a look at these other ideas for wedding gifts!